There are many gentlemen named Brian Hayes, but they're not all me. For example: a few years after I graduated, the high school I attended even hired a teacher named Brian Hayes (but he was not me). How many of these other Brian Hayes gents could also be comic book fans? You'd be surprised! If you go over to YouTube and search for "Brian Hayes Superman" you get a video with some drunken Irish guy blathering on and on about Superman's powers or something or other. THAT IS NOT ME! Here is the link to that video but, believe me, you will not find what you see to be one bit edifying. Although there may be many Brian Hayes characters crawling around the planet, there is only one hayfamzone and (good news) YOU ARE A MEMBER OF IT IN GOOD STANDING! At Long Last, New Gifts from the Hayfamzone! I used to make a regular practice of sharing with you some of the wonderful comics-related websites and the like that I would find. 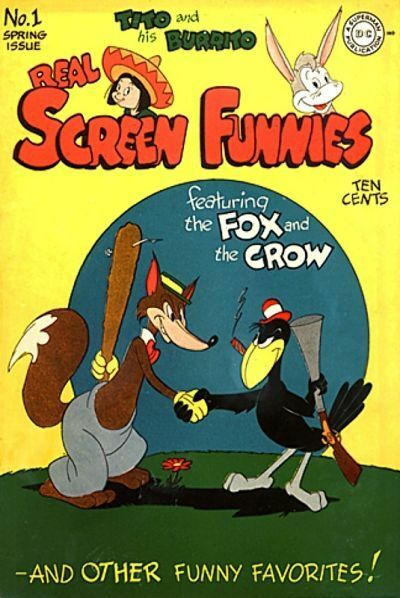 For example, I reported a couple of years back how I had come across Fox and Crow cartoons posted on YouTube (and none of which I had previousy seen, so I figured they might be new to others also). I now have an UPDATE for you on that item! Now in case Antenna TV is not available in your neck of the woods, I still have good news for you! There is a Totally Tooned In website and you can choose from a long menu of cartoons to download and watch. I saw in the list a couple of Jill Thompson's Scary Godmother cartoons ready to download. Keep in mind that all of the foregoing was merely the update to my old gift. I'm not through with you yet! Maybe you're a comics news junkie like I am and maybe you check in every day like I do to see any new developments in the world of comics. Well, I've learned of a site on par with Newsarama and, every time I look there, I see an item that Newsarama has not yet told me about! I understand that the site used to be directed at retailers but these days it is perfectly accessible to fans like you and me. Please take a look at and enjoy icv2 . Can you name your five favorite TV series of all time? I can, and one of mine is the 1950s Superman show. 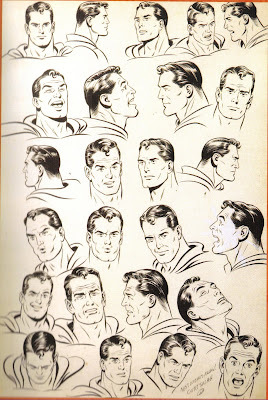 The George Reeves flesh-and-blood characterization is almost every bit as important to me as Curt Swan's interpretation of Superman in the comics. When my butcher at the grocery store sees me he bellows, "Hello Clark Kent!" Mind you, that gentleman knows nothing about my interest in comics. He thinks I look like Superman. Maybe I also think that a little bit since my avatar over on ebay is the face of Superman from the iconic Neal Adams and Murphy Anderson cover to Action Comics #412, the original artwork of which I owned for many years. Metropolis, Illinois is located at the southern tip of the state, about 600 miles below Chicago. In 1972 DC Comics proclaimed Metropolis as the "Hometown of Superman" and the Illinois state legislature in turn passed a resolution also declaring Metroplis as the "Hometown of Superman." The same year, as I was walking along a Chicago street, I stumbled across a brightly colored yellow book of matches touting The Amazing World of Superman (and I'm certain I have that matchbook around here someplace, but I'll save the search time by just showing you this one that I found online); I was always amazed that that matchbook swam all the way upstream to Chicago for me to find. Every June Metropolis holds a Superman Celebration. A different gentleman is chosen to be Superman for each Celebration, and he wanders the streets in costume for the weekend as a roving ambassador. 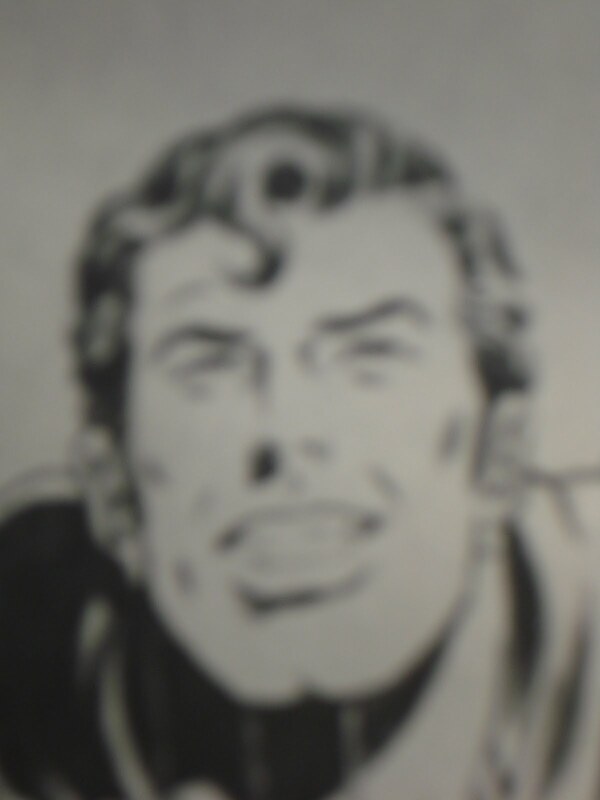 In the middle of the last decade I applied to be that year's Superman but the organizers foolishly chose someone else. I see now that one of the Special Guests at last month's 2011 Superman Celebration was Brandon Routh, star of Superman Returns. Have you heard there's going to be a new Superman movie right around the corner? In fact they'll be doing filming for it in and around Chicago later this summer. The project is going by the name Autumn Frost but I don't know if that's a codename that will evaporate or if that will really be the movie's title. The Chicago media did a good job alerting the masses that there would be a couple of open casting calls in the Chicago area and that the producers were looking to hire extras for the movie. 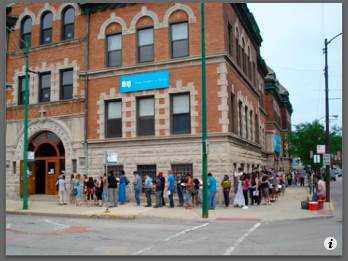 One of those line-ups was held at The Chicago Academy for the Arts (which just happens to be where The Princess of the Hayfamzone attended high school) and I decided to take a bike ride over there to check out the scene on behalf of all the faithful Hayfamzone Blog readers. The long line did wrap around the castle-like building. It moved fairly quickly but stayed at a constant length because new arrivals kept replenishing the back end. Down below is a view of that day's line for you. Maybe you're wondering if I filled out one of those applications? Well yes I did! But I followed the advice on the Autumn Frost website and submitted my application online, which the site told me was every bit as valid as applying in person. Will I be appearing in the movie? You'll be the first ones I tell if I get that nod!